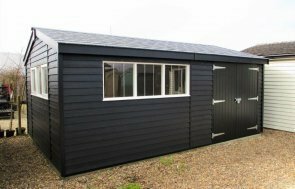 This attractive looking Superior Shed has been installed in our customer’s garden in Dursley, Gloucestershire to use as a year-round hobby room. The exterior of this building has been created using shiplap cladding, coated in our Valtti Paint system, in Sage. Heavy duty felt has been used to line the roof, along with black guttering to aid drainage. Internally, the customer has opted for oak faced ply lining on the walls, insulation in the walls and ceiling, a heavy-duty floor, an electrical pack with a heater, and a workbench, which has been positioned underneath the windows. All of these internal features allow the customer to make full use of this building throughout the year. Like what you see? 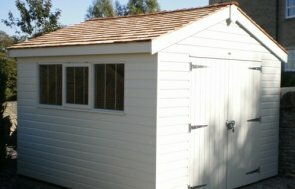 View our complete collection of Garden Buildings here. Alternatively, you can pay us a visit at one of our seven Show Centres, where each location has a vast array of buildings on display to help you find the perfect garden building. If you have any queries regarding this garden building or one of your own, request a callback, contact us or call us on 01760 444229 and one of the friendly team will be able to assist you where possible.